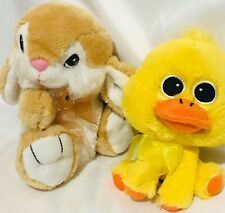 Dan Dee Duck Toy Plush 28” Pillow Large Easter Chick Collectors Choice. Condition is Used. Shipped with USPS Priority Mail. New ListingDan Dee Brown White Rabbit Bunny Collectors Choice Plush Soft Ribbon Neck 12"
2015 Dan Dee Collectors Choice Plush Easter Bunny - Pink & White - 14" Sitting - Embroidered Eyes - Soft & Cuddly. 1980 Dan Dee Gorilla Ape In Hat 5" Tall - great played with condition, light play wear from play/handling, terrible glue job by mfg near leg (last pic). 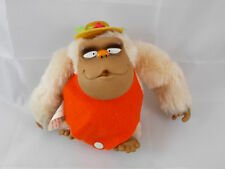 17” DAN DEE MONKEY BOY & Girl Stuffed Animal Doll Plush. Condition is Used. DAN DEE white TEDDY BEAR W/ REVERSIBLE SEQUIN HEART PILLOW. She is holding a red heart pillow with reversible sequins on the front. Bear is white in color. Overall good condition. This is a very cute 11 in high sitting white fuzzy bear with red paw pads, inner ears and nice It wears a red Grosgrain Bow on one ear and red sheer nylon bow around the neck. Dan Dee White and Red Teddy BearPlush 2009. This cute turkey dances and sings to the tune of "Turkey and the Straw". Included is her white bonnet. Item is in good working condition. Toys are sold as is. Requires AA batteries (not included). Pre-owned My First Christmas Bear by Dan Dee. Great for a Baby Boy. SUPER CUTE SOCK MONKEY FAMILY. 8" Lovey Stuffed Toy. Good used condition! Dan Dee Collector's Choice Large Brown Stuffed Animal Horse. Made with EarthRite Fiber. DAN DEE WINTER WHITE BOY BEAR. HE IS WEARING A BLUE JACKET AND HAT. 2008 ON FOOT. New ListingDan Dee Teddy Bear Happy Holidays from California 24"
12"Dan Dee Collector’s Choice Pink Winter Bear. Excellent pre-owned condition! New ListingDan Dee Pink Teddy Bear Embroidered Heart Love Plush 12"
Dan Dee Plush Tan Teddy Bear Sweater Red Blue Stuffed Animal Soft Toy Shaggy 9"
Dan Dee plush tan colored teddy bear. Wearing a heavy cable knit sweater that's red and blue. See photos. Condition: bear is in good pre-owned condition. This is a Lot of 4 Pre-Owned Dan Dee Collector's Choice, 7" Blush Bunnies. One is from 2010 and Blue with a Blue Ribbon at the neck. One is from 2010 and Cream with Pink Embroidery on the Feet and a cream Ribbon. HER DRESS IS RED WITH GREEN TRIM AND WHITE FAUX FUR. 2003 RED EMBROIDERY ON RIGHT PAW. HER CAP IS RED WITH WHITE FAUX FUR TRIM AND BOBBLE ON TOP. Dan Dee SNOWFLAKE TEDDY Plush White Bear 2002 Red Green Gold Lace DanDee 14"
Dan Dee Snowflake Teddy 2002. Plush Stuffed Bear. Gold Trim/Accents, White Lace Accents. White Bear. Hair Bow Accents. Red/Burgundy, Green Dress. Hang hook at the top of head. Adorable and funny vintage plush caterpillar puppy by Dan Dee He still has his plastic hang tag. Appears to have just been displayed rather than played with. Come minor discolorations from age and display. 10 colorful little legs. Wearing a purple and pink hat. Coming from a smoke free/pet free home. 12” long. Dan Dee Teddy Bear Plush Stuffed Animal Black Sweater Love Valentines Small 7"
Bear is in excellent condition with minimal signs of wear! Dan Dee 100th Anniversary Teddy Bear Toys Stuffed Sweater Gray with patches. Condition is Used. Condition is Used. Great lot if you are looking for a variety of monkey plush. All high quality, very soft, very clean plush. Smoke and Pet Free! Dan Dee Brown White Rabbit Bunny Collectors Choice Plush Soft Ribbon Neck 12"